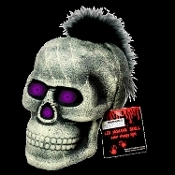 Add a little bone chilling rock 'n' roll spirit to your Halloween or haunted house with this spooky fully dimensional skull, sporting a black feather Mohawk! The creepy eyes glow in the dark with morphing color changing LED lights. Scary life size fake human skull is made of aged grayish crackled yellow-white over black base dense polystyrene foam. Alternating blinking, morphing, flashing, strobing color change lights for a ghoulishly spooky effect! Colors included are blue, purple, green, red and yellow. Glowing, color-changing eyes and nose on this creepy, eerie skull will give trick or treaters a fright! Life Size Light up Skull with faux hair black feather mohawk will make your spine tingle as it moves with the slightest of breezes! Measures approx 6-inch (15cm) High x 5.5-inch (13.75cm) Wide x 7-inch (17.5cm) Deep, without mohawk.